We make it a point to make you feel at home the moment you arrive. New patients often remark how “relaxed” our office is. That’s good, because our goal is to offer state-of-the-art chiropractic care in a comfortable surrounding. So make yourself at home! When you arrive our staff will help you fill out the necessary paperwork and figure out any benefits you might have, then give you a short tour of the office. They will then take you back to watch a 5 minute video that will introduce you to what will be taking place. We promise there will be NO surprises. When the doctor arrives, he will first ask you a few questions then gently begin to feel your spine in order to start determine if you are in fact a chiropractic case and if we can help. Depending upon what he finds he might take an x-ray or run a scan down your spine (it doesn’t hurt a bit) in order to verify what his findings. After the tests are completed, he may or may not need to do a few other things with you on the adjusting table. Plan on about 30 minutes for this first visit. On your next visit we will discuss what we found on the initial visit and offer recommendations. The doctor will take as long as you need to answer all your questions. Our motto is, “Always do what’s in the patients best interest.” His suggestions will help you attain the highest potential your body is capable of. Plan on about 20 minutes for this visit. Once the plan is agreed upon, he will begin the process of adjustments. Your regular care won’t take near as long once the problems are located but your results will be determined by your willingness to stick to the program to make it work. Repetition is the key here. Rome wasn’t built in a day! Like a regular workout at the gym, each subsequent visit builds on the previous ones. Miss a visit and you can lose the momentum necessary to make the needed changes. We recognize your time is valuable. So we do everything possible to run on time and minimize the impact on your busy life. We will always do what’s in your best interests. Thanks for thinking of us. 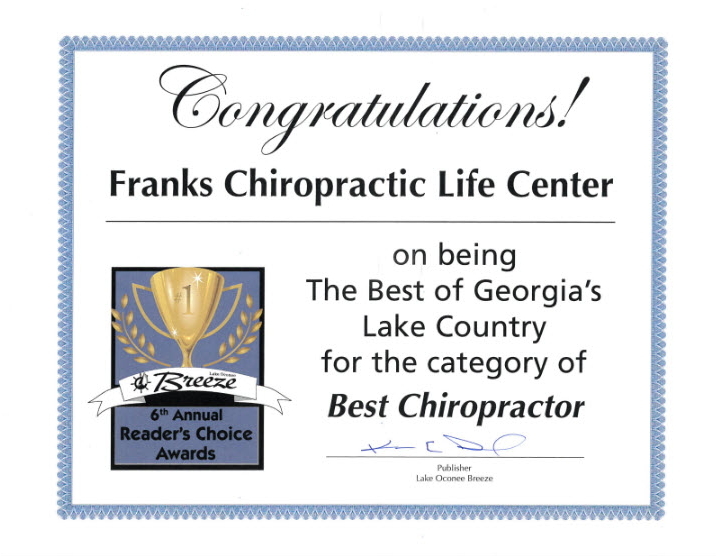 When you’re ready to take action, call us at Franks Chiropractic Life Center to arrange your first visit: (706) 453-7411. Click here to learn about our fees.